Is the 2018 Mazda CX-9 as good as other crossovers? The 2018 Mazda CX-9 is a good example of a crossover that can haul cargo and people without compromising your ability to drive. With its solidly made chassis and intuitive handling, the CX-9 combines fun driving with all the essential utility functions. Add the striking exterior fastback rear end and high quality cabin, and you’ve got a winning combination. For the 2018 edition, Mazda added rear cross traffic alert, blind spot monitoring and automated emergency braking on all trims. The CX-9 also comes with the patented G vectoring control that minimizes engine torque. The reduction in torque is something you will hardly notice, but it is there and is important when you’re going into corners. With this feature now a standard it is easier and safer to drive the CX-9. A new Sport package has been released and includes several safety features. Among them are the adaptive cruise control, rain sensing windshield wipers, lane-keeping assist, auto high beams and more. The 2018 edition also includes front passenger seat lumbar and height support and front seat power adjustments. The Touring trim also comes with additional enhancements so the seats are more comfortable. The CX-9 2018 model has a 250 hp turbocharged four cylinder 2.5 liter, and it is complemented by the 6 speed automatic. While most cars this range offer the V6, Mazda opted to go with the 4 cylinder for better fuel economy. The engine itself sounds impressive and does well when used for acceleration. The engineering work also allows the CX-9 to produce optimum power even when at low speeds. For the driver this means faster acceleration and better throttle response. 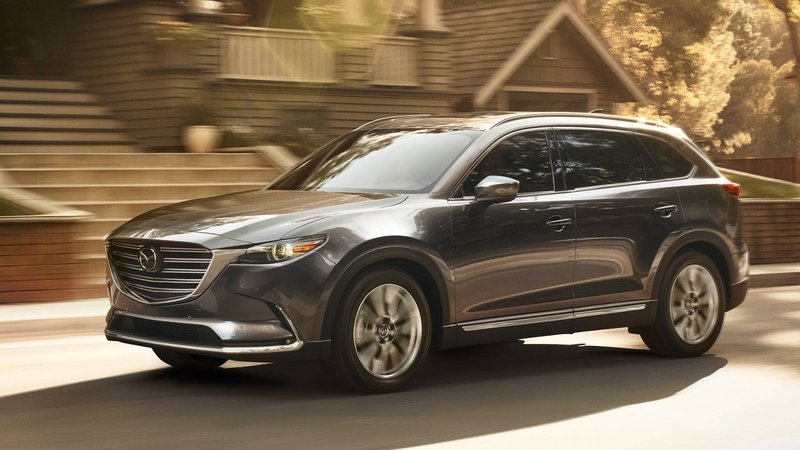 The CX-9 engine gives this a towing power of 3500 lbs, great if you’re hauling cargo. Mazda is known for excellent stopping power, comfortable handling and pinpoint steering. To no one’s surprise the CX-9 lives up to this and more. The addition of the G Vectoring Control it’s become easier to manage when cornering. As you go to a corner the control kicks in and simplifies the movement. The CX-9 also doesn’t lack in power thanks to the turbo boost and the linear throttle response. With the 6 speed automatic, normal and sport modes you can drive and shift the way you want. Some may prefer the normal mode while others want more action with sport, so it’s up to you. The CX-9 reaches 60 mph in 7.1 seconds and needs 15.5 seconds to reach a quarter mile. Overall that’s not bad when compared to other cars. The handling is light, and it is not an exaggeration to say it’s almost like you’re handling a compact SUV. The suspension offers good support but is flexible enough when you’re driving on rugged terrain. The steering is good and complements the handling. As for brakes the CX-9 definitely excels in this area as well. The pedal is solidly made and its ability to suddenly stop is exceptionally good. It only needs 168 feet to make a full stop at 70 mph, very impressive for a three row crossover. The first thing we noticed with the cabin is that it is made from high quality materials. The styling is excellent and visibility from the rear is really good. The 2018 models can have the front seats heated and with power adjustment. Tilt function and lumbar support are also built into the front passenger seat as well. The luxury Grand Touring editions have the rear seats heated and also heated steering wheel as well. The seats in the second row have also been tweaked so they’re more comfortable even when sitting there for long stretches. The rest of the cabin has real rosewood, brushed aluminum, quality graining and soft touch plastic. The dashboard has a 7 or 8 inch screen depending on the trim. There are controls for the various functions and features, and hey are all easy to reach. The CX-9 does not lack in this department either as the interface is intuitive and easy to follow. With the Sport trim you get the 7 inch screen while the Signature, Touring and Grand Touring come with an 8 inch display. You can control and change the options via the touchscreen or by the knobs. The console also has buttons so you can use those as well. There is support for voice commands and the software is simple to use. Other features include a Bluetooth phone, HD radio, audio streaming, online radio apps and more. There is no lacking of quality crossovers in the market, and Mazda has been responsible for some of the best ones. However they really upped the ante with the CX-9 as it offers comfort, space and a pleasant driving experience. Really what more can you ask for? 2018 Land Rover Discovery: is the Discovery as good on the road as it is for off road? Is the Nissan 370Z still a good option for drivers?